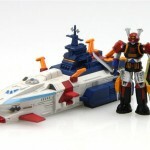 To gear up for the up coming release of Megahouse’s Cosmo Fleet EX Super Sentai Ranger Mechanics EX(what a mouthful!) set; Preview Gallery just posted up a photo gallery of this set. Each one will run you about 1600 yen a box, or you can purchase an entire carton for 14,175 yen. The set is expected to ship in late September. While Toy Fair was going on, the 2013 Winter Wonder Fest was held just across the boarder. 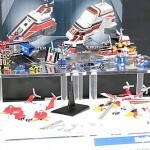 Megahouse was present at the show, and they had on display the next set of miniatures from the Cosmo Fleet Collection line. 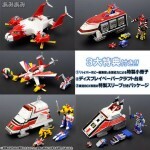 Cosmic Fleet Collection Extra Ranger Mechanix Set 2 will feature the Goranger’s Variblune and Varidorin, Liveman’s Machine Buffalo, Goggle V’s Goggle Ceaser, Sun Vulcan’s Jaguar Vulcan, Denjiman’s Denji Tiger and miniature in scale representations of the team’s robos. Each mecha can be stored within their transport mecha! Check them out after the jump!